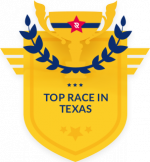 Recognized as one of the Top Races in Texas! Kick for Kenya is Back! KWO Ministries is proud to welcome you to one of the premiere running events in the Permian Basin. Over the last nine years, Kick for Kenya has become one of the largest and longest running charity races in the area, featuring a 10K-5K-1K format. Online registration is available now! CLICK HERE to register. download and print the Registration Form HERE and mail it with your check. Early registration for the 5k/10k is $35 and the Kids 1k is $20. Early registration ends Nov 7, add $10 for late registration. Packet pickup and late registration is Friday, Nov 9 from 3-7pm, or Saturday, Nov 10 from 7:30 to 8:30am. Contact Layne Coco at 432-528-4018 or at layne@kwoministries.org for more information. The race will be held at the Golf Course Road Church of Christ, 3500 W. Golf Course Rd. Midland, TX. The 1K Kids Fun Run starts at 8:45am with the 5K/10K kicking off at 9:00am. Chip timing will be used for the 5K/10K run. Top 3 Male/Female in 13 age categories. Sponsorships are still available! CLICK HERE for sponsorship form. Thanks to our current sponsors shown below! Check out this cool drone shot from 2015's race!